Note: Spoilers -- if you don't want to know what's on this DVD. One of the differences between the behind-the-scenes materials that got included in the EE Extras and the ones on these new DVD's is a franker atmosphere. The number of blipped-out obscenities is not greater, but there are more mooments in which cast or crew-members act as if they are *not* 100% thrilled to be working on this production. Some of the responses are frankly testy, others veiled in wry humour. In the Costa Botes material for The Two Towers, there is are also more sexual innuendo (all of it playful, nothing serious). Very guy-related sexual innuendo. D: Mine is pointing up, and yours is pointing down. B: Yeah, but yours is a darker colour. D'you see? D: What? Yours -- yours seems to be slightly thinner, but longer. As if finally noticing the presence of the camera, they turn and begin pulling up their trousers. Dom wheels around and picks an inflatable doll up off the bed and throws blankets over it, talking over his shoulder. B: ...the Dukes of Hazzard. No! The knights of Rohan. The doll stowed, they finish tucking in their shirts and buttoning their trousers. B: And there's no doctors, of course. D: They have to operate, so Merry-- [To the camera person:] You can cut that out, hey, Hayley*? *Hayley French filmed the behind-the-scenes material along with Costa Botes. 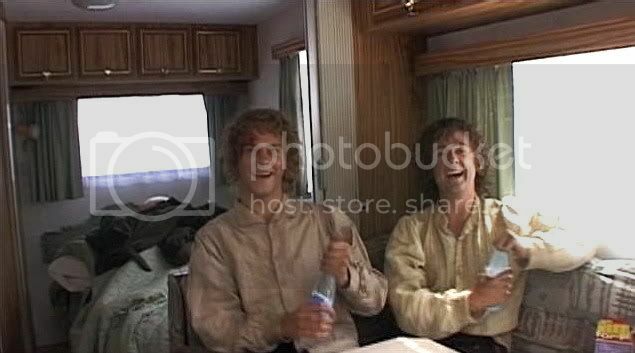 They begin to laugh, move over to the little dinette table, each with his bottle of water, and begin to tell the camera person more fully and seriously about what will be coming up for their two characters, newly captive to the Orcs. This Extra provides a great opportunity to see these two friends in action, for they appear in it together frequently and at length. From subsequent interviews, it sounds as though their friendship grew quite a bit during this period, helped along by the fact that they had only each other for company, filming Pippin's and Merry's scenes for days at a time in isolation from the rest of the cast. All in all, I thought the Extras for The Two Towers were consistently interesting, and a lot of fun to watch, if one is interested in more than Elijah Wood. 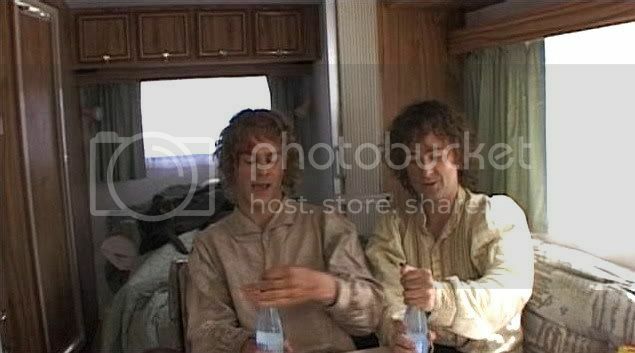 Elijah is in the footage, but not as much as in FotR. As if it were a theme in this segment, there was another good example of "guy humour". It was not an intentional improv, the way it was with the two hobbit actors, but it was funny nonetheless. The sequence comes towards the end of the Extras, making a sort of bookend with the guy-jokes at the opening. Most of the male cast members are assembled in a large room, which seems to be an actor's lounge and dressing area. All the actors are in costume and the atmosphere is relaxed and easy. Billy lolls on the couch beside Karl Urban; Dom catches apples in his mouth that Bernard Hill tosses to him. O: You're just theatened because I've got a bigger bow than you! That Viggo. Ya gotta love him. What a new milieu this had to be for Elijah Wood, who never went to school. Sure, he knew other guys and men working on sets; he had a brother. But the whole locker-room atmosphere of a lot of the behind-the-scenes is something I'm betting he completely missed, growing up as a working child-actor tutored at home. How lucky for him to be thrown into it after he was already mostly formed as a person. Games of one-upsmanship between males can be pretty intimidating, especially when cruel men or boys dominate a group. But if it is done in a spirit of camaraderie, it can be a very bonding, maybe even a necessary experience for boys and men. Some modern males find this sort of experience later in life through sweat-lodges at new-age retreat centers, or banging drums in the woods, but most males go through this when they are young: in school, at camp, in the military or any all-male setting in which 'who's got the bigger bow' -- literally or figuratively -- is a matter of keen concern, whether expressed as open intimidation or teasing humour. But, as Viggo points out, it's the arrows that count. This is just adorable stuff. What fun! Isn't it fun? I love that about the Extras for all the DVD's, the way they make us fans feel included. No, I haven't seen the limited editions yet (just got word they've been shippend- it might take a month before I get them..) but I don't mind spoilers. In fact, yours make me look forward to watching them all the more! Pics and dialogue just make such a lovely preview, and they bring across that atmosphere of male bonding and camaraderie perfectly. Surely it must have been an eye opener for Elijah, and a wonderful one at that! Thank you for sharing, darling! Cool icon, Hobbitlove! Well, I'm glad you are not *spoiled* by visiting. Yeah, it sounds like that most of what they shared was a lot of fun, entering into lasting friendships. That somehow reminds me of a Craig Parker (Haldir) and Mark Furgeson (Gil-Galad) panel at RingCon. 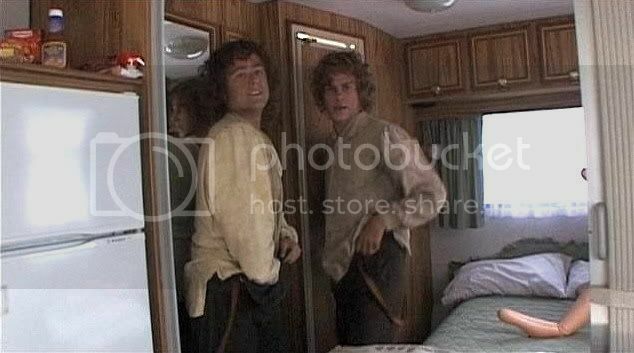 They were comparing the weapons of each people ... well, of hobbits, men and elves... and Mark said: "Some people have tiny little daggers, some people have sword and there are very few people *insert suggestive smile here* that have a SPEAR!" Is that a funny story! Those two must be comedians off-screen. 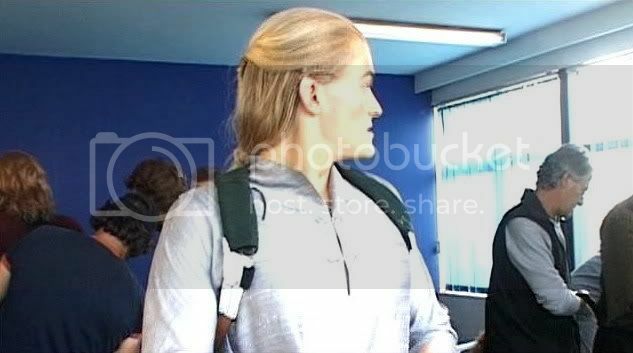 You know, in the Two Towers extras, there's also a lot of amusing interaction between the actors who played Gamling and Hama. It's not naughty, but exemplary of that "guy-friends" ease and camaraderie. I really enjoyed watching this set of extras. It's the arrows that count. 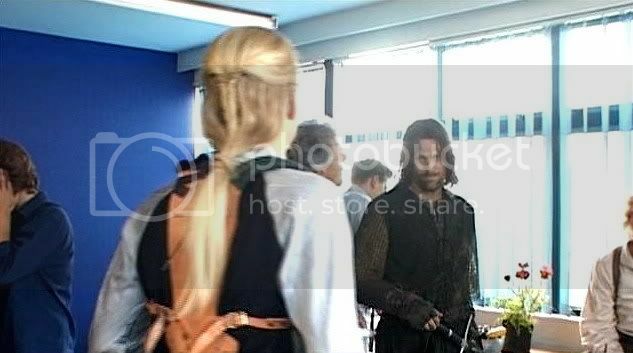 Good grief, isn't Viggo just so damn HOT as Aragorn. Yes, hot, hot, hot. And funny. Maybe I should watch the Two Towers tonight after choir....? The screen caps are a delight; the childish boy jokes are endearing, but neither of these would be nearly as much fun without your spot-on commentary. Thank you for including all three! Why, thank you, Bandwench. I consider that high praise, since your own LJ is so entertainingly written. Yes, their pranks are endearing. There is a big difference between mean-boy-pranks and those that real comrades play on each other. I think it was great that there were men of all ages and levels of life experience on this shoot. That must have helped things from getting too over the top, which might have been the case if all the men were young and sparring for who was top dog. They all spoke so fondly of the teasing and pranks that it is easy to believe that it was a very important part of why the group dynamics worked so well, and made the movie the joy that it is to watch. And Elijah especially seemed happy about having been included--perhaps it was the first time he had truly been in a group and got to enjoy such bonding other than perhaps with his brother at home. (Although Zach is enough older, even that might have been a limited interaction or a completely different dynamic.) I think this was probably the first time he was truly "one of the guys" in a big group. I am sure you were right -- and he it seems he really loved it. A frat boy at last -- and he didn't even have to go to college! Billy and Dom? They surfed together more, too, didn't they? Billy kept up his surfing in SCOTLAND, for heaven's sake, so they say. I just read that Dom says he is up to intermediate, now that he and Evangeline Lilly have been living by the beach at Kaihua (only about ten miles from my daughter's dorm! -- she's hoping to sight them someday). Maybe that's why Dom was mostly absent from the fan conventions -- too depressed to do the hail-fellow-well-met routine, and seeing it too much as the venue of has-beens. Yes, he seems far happier. I'm not a fan of Dom in the sense of following his career, but he's done such a good job on Lost, which is a famous and highly-thought-of show, I am sure it worked out really well for him. He probably has made friends one it, too, since it's another long-running project like LotR. And if he and his cast-mate Lilly are having a real love affair, all the more would he feel happy and fulfilled, since she is living right there, not bound to fly off somewhere else every other day. Aren't they the cutest together? I just read a little article from Sept. in which it was told how important Billy's supportive friendship had been to Dom after LotR was over, because Monaghan went into a slough of depression as an after-effect of the experience. I wondered if that were so, since he, more than any of the other hobbits, seemed to drop out of public doings. The article made it sound as though Billy was vital for helping Dom get through it. Fans like to link Dom with Elijah for RPS (but Pippin and Merry for FPS), but it sounds like Dom and Billy forged the important relationship during all those hours of shooting and waiting around to shoot. They're so ridiculous! I agree, I love your commentary. Viggo's got a great retort. Orlando I think was also a little out of his league, first big film, sort of finding his feet. Whereas Viggo always struck me as a "get the job done" kind of guy, very workmanlike and trying to make the best of an endless shoot with a kid back home that he missed. I hope they can look back in fondness on this very special time in their lives. Oh, I think they both do. Viggo is a very earthy man, very conscientiously earth-friendly and respectful of other peoples, as well as artistic and poetic in a general way. If nothing else made him feel the shoot was worth it, surely the heartfelt devotion and admiration of his "men" - the stunties and extras who worked with him all those ong hours - would have made the experience special. When they did that Maori hakka for him (which, they explained, they did for kings) at the end (RotK extras), I am sure he felt incredibly honoured. How many shoots would that ever happen on? I think Bloom had a great time, too, but just doing all the boy stuff he liked - surfing, bungee jumping, drinking in the whole aura of film-makingk, and talking the hind end off a mule, that sort of thing. He definitely was out of his league playing "who's clow is bigger" with Viggo, though. 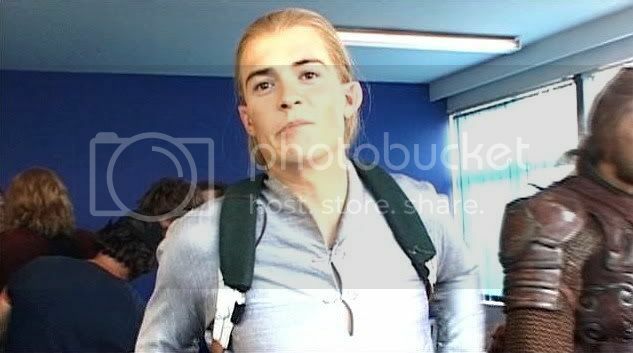 When I watch the extras, I often think that of all the major cast members, Orlando seemed the youngest, the most boyish in his outlook and behaviour. 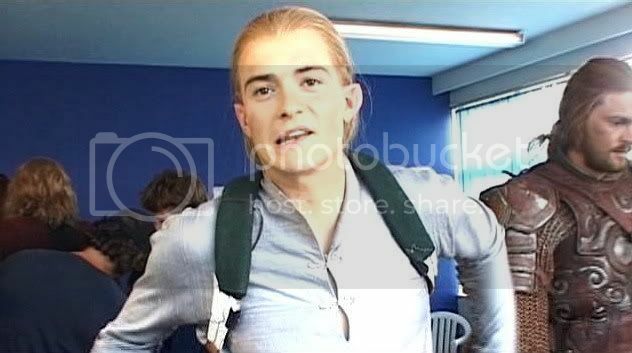 He did a great job as Legolas (I thought) but he really does seem like a kid. 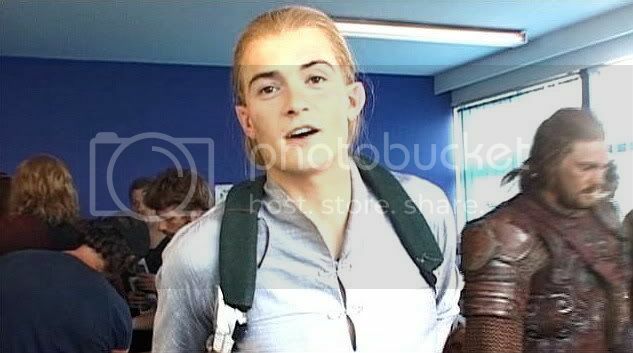 I also adored his Legolas. I think the role was perfect for him. I really was stunned by the offscreen contrast to his real self. Well done, Orli! You're right, he really does look awfully young in those caps -- he acts even younger, though. I just can't get up a swoon for him, as much as I appreciate his work in LotR and think he's got a fine pair of legs for being an Elf -- and looks surprisingly good oiled up in Troy (for such a basically skinny guy). Well, candle and torch light never hurt anyone's looks; ask Mr. Baggins. Funny how I can say that, when he never EVER made me swoon. I mean, he's so beautiful as Legolas - moves just like an Elf, it's so lovely to watch - and yet my swoon-o-meter moves not an inch. I do swoon for him as Will Turner in the second POTC outing. But silky-smooth golden locks on a bloke clearly do nothing for me. Nope, it's the raw, rugged manliness of Aragorn - rawr! - or the ethereal eroticism of Frolijah for me. I didn't see the second Pirates of the Caribbean film, not having been very impressed with the first ones. So he improved in that one? No the silky-smooth blond locks didn't do anything for me, either, although I thought they worked great for him portraying an Elf. But his dark tumble of curls in Troy made him look excessively dishy (well, I am sucker for dark curling locks, though...). Unfortunately, however good he looked to me in that film, the character of Paris was not one to inspire a quickened pulse. The second POTC movie is not a patch on the first one. 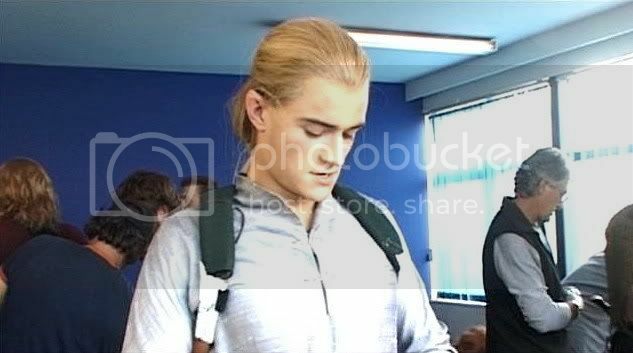 Orli and Johnny made it just about worth it. Yes, he's improved as Will. :) Mmmmm. The Troy curls were gorgeous, sooooo Frodoesque, yum, but Paris is such a wimp! "That Viggo! You've gotta love him." What an amazing post, sweetheart. So funny and great. Isn't it great to be a FAN of all that? I LOVE the extras so very much, I can't tell you. Ah, Julchen, weren't they cute? I think Viggo definitely trounced Orli, if gently, in the "bigger bow" exchange. What a great group they were. I am so glad the Extras were made so that we could feel a part of it. That's so true, we could feel a part of it! I'm very glad my dear! And YOU can be very proud of all your works.